thanks for this post. Are you saying that author is better than publisher, and that the publisher markup should be completely removed? I ask because I’ve done what Google says was ok and have both on my site. The testing tool shows the publisher (company) info. But if I read your post right, you;re saying it’s better to just go with author. If so, what was ever the point of releasing the publisher snippet? Mark, great question. Publisher should only be added to your homepage. Then you should use rel=author on any page you want to show with author details (and be tied to you as an author). I’ve seen rel=publisher mess up rel=author. Let me know how it goes once you make the necessary changes. 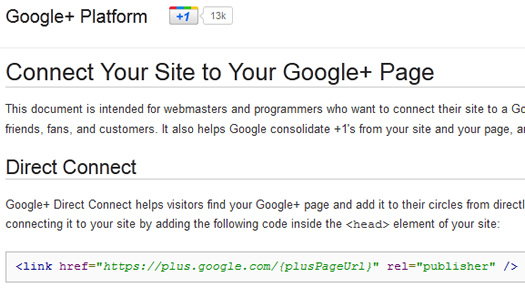 Thanks for writing this insight post on implementing Google authorship verification. Can please tell me how many days it take Google to update after implementing this steps? Hi Lionel. Google needs to recrawl your website first. Depending on your site, that can be soon, or it can take a while. I would hang tight and monitor your site over the next week or two. 1. To clarify, if you have rel=publisher on the home page, does Google still display the icon to the left of the SERP listing? 2. If you have a business website and only one author for the entire website, should rel=publisher be used on all pages in the 2 link method and should the rel=publisher be used on the Bio page of the 1 author in the 3 link method? 3. Do you know any fast track secrets to getting access to Direct Connect? I highly recommend adding rel=publisher to just the homepage. Then add rel=author to any content pages (content the author is publishing). If you do that, then you should have the correct author image showing for the content. Regarding Direct Connect, I don’t know of any fast track. It’s algorithmically determined. I would focus on what you can control (authorship), and then work towards gaining direct connect over time. I hope that helps. Thanks for the response. I hear what you are saying. I’ve made some implementations of rel=”publisher” on the home page and rel=”author” on internal pages. However, when I include the Google+ badge (not the +1 button), it adds rel=”publisher” to the sidebar or footer of every internal page. Is this okay or should I remove the badge from internals? Good question. In order to accurately troubleshoot the issue, I would remove the badge, let Google recrawl your site with rel=author and rel=publisher in the right places. Then you can think about adding the badge and see how it impacts your setup. Thanks again Glenn. Last question, I promise. What is your strategy when you have 1 publisher with multiple websites? Do you create multiple Google+ business pages per website? Is there a way to “verify” multiple websites on a Google+ business page? I have been trying to Get my author image in the search results from the pas1 full year now and i am the one person who is just fed up now with this. Again my photo shows correctly in the rich snippets page but not in the actual search results….. Please help me I beg you!!!!! Also, I saw you are using rel=author multiple times on each page. I wouldn’t do that. Once you make the changes, your site will need to be recrawled before author details can show. Stop back and let me know how it goes. How can you say that I am using rel=author multiple times on each page. I have just placed a small author box in the sidebar of the website and there I have linked my name to the author profile using the rel=author thing. I have’nt placed it on any other widget or page. Ritish, I checked the source code for your pages. I notice rel=author listed twice on the page. I wouldn’t do that. I would only provide it once on the page. 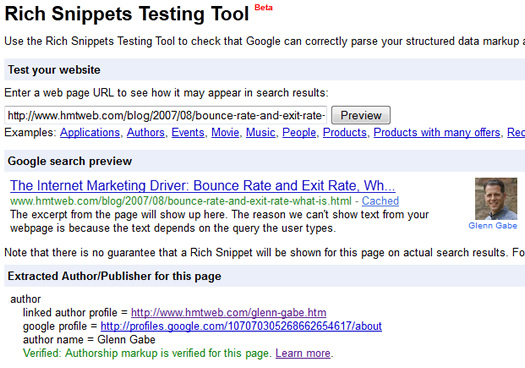 I changed the rel markup as you said but even after 5 days there is no Author Image showing in the serps. I think Google doesn’t want to show my image in the serps. Ritish, I just checked your site and you haven’t changed the way you are handling rel=author. Follow the guidelines I listed above, and only provide rel=author once on the page. Then you need to let Google recrawl your site. I hope that helps. Now I have made the changes you can check…. And now I have removed the second rel author markup. After 1 year my author image is showing in the serps. And all the good wishes goes to you….